An ice shelf is a thick floating platform of ice. Ice shelves are found not only in Antarctica but also in Greenland, Canada, and Russia in the north polar region. 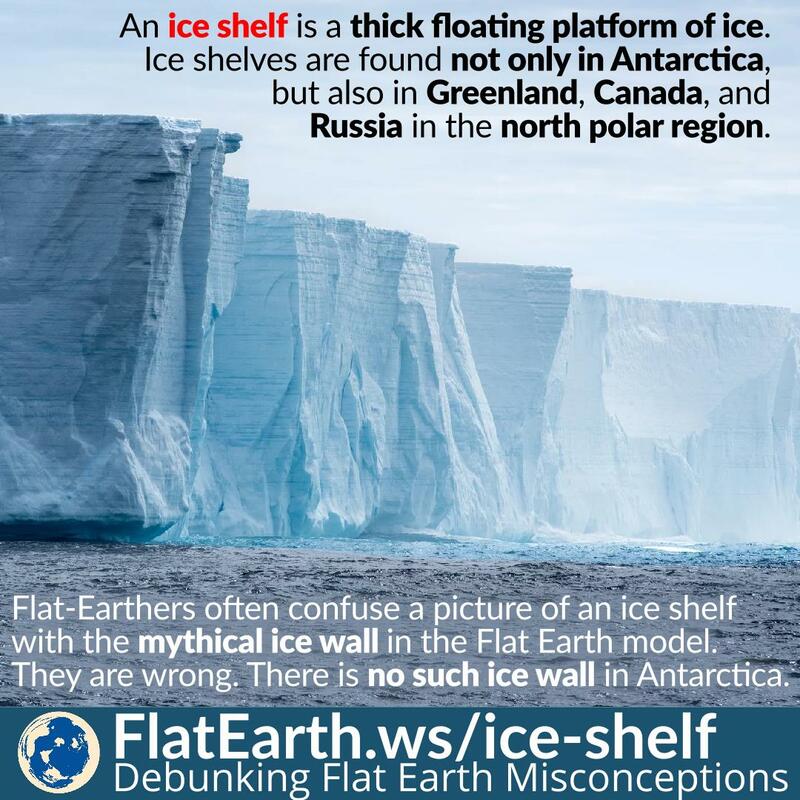 Flat-Earthers often show off pictures of an ice shelf as ‘proof’ of the existence of the mythical giant ice wall surrounding the Earth. They are wrong. In the flat-Earth mythology, Antarctica is described as a vast icy land on the edge of the Earth. There is supposedly a giant ice wall in Antarctica, surrounding the entire Earth in a circle. They like to show the pictures of this supposed ‘giant ice wall.’ In reality, those are pictures of an ice shelf. An ice shelf is a thick floating platform of ice that forms where a glacier or ice sheet flows down to a coastline and onto the ocean surface. An ice shelf is thick. The thickness ranges from 100 to 1000 meters, but only a small part of it is above the sea level. There’s nothing mysterious about ice shelves. They can be found in both polar regions, including the Arctic in the north.